Friends, I have a confession to make. If you had asked me last week, "Who is Clarence Darrow?" I would have answered, "Um... a lawyer?" I didn't know much about one of America's most famous lawyers, but in the tradition of "everything I know I learned from theater," after seeing the one-man show Naked Darrow at Illusion Theater, my eyes have been opened. Gary Anderson has spent years perfecting his performance as the famous lawyer in the play that he wrote, and it shows. He's not so much acting as being Clarence Darrow. 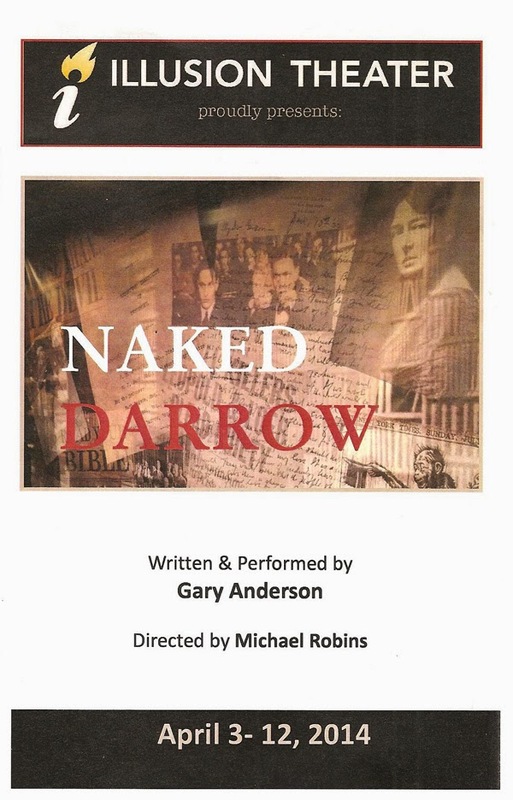 Naked Darrow takes place in 1937, near the end of his life, when he was deep in the clutches of dementia (and possibly Alzheimer's disease). In a 90-minute stream of consciousness, Darrow talks to people who aren't there (including his wife and mistress), relives some of his more famous trials (including his own, for jury tampering), and gives some of his most compelling closing statements. He recalls moments from his childhood, time with his first and second wives, and in the most touching sequence, he visits his newborn granddaughter and sings her to sleep with "Solidarity Forever" (Darrow was a prominent labor lawyer). The play shows us the personal side of the famous public figure and the personal costs of being a lifelong public servant. The most compelling scenes are the ones in which Darrow delivers his famous speeches. He was an eloquent and persuasive speaker, and Gary Anderson portrays this very well. This is where he really shines as he commands the theater as Darrow legendarily did the courtroom. He transforms into the character so that no "acting" is visible to the audience; it's like you're watching the man himself. The play was last presented in the Twin Cities at Park Square Theater in 2011. It has since been revised and performed around the country, including Off-Broadway. This production features direction by Illusion's Artistic Director Michael Robins, and a sparse set by Dean Holzman, with set pieces of a desk, a few chairs, a window, and a bookcase floating in the empty space as if in a dream. Lighting by Michael Wangen helps set the mood, and images projected on the window give us a visual of the various defendants and places being described (projection design by Jonathan Carlson). If you're a legal buff, or just want to learn a little bit more about this famous and influential American, with a lived-in portrayal by Gary Anderson, get to Illusion Theater's lovely 8th floor theater space in the Hennepin Center for the Arts before Naked Darrow closes on April 12 (bonus - discount tickets on Goldstar).